The Max M7 (superseded by the Max M8) is still a great offering in the Max Trainer series from Bowflex, and this is my updated Bowflex Max Trainer M7 Review 2019. This piece of equipment is like something you’d see in an expensive gym – only better. We’d go so far as to say it’s on of the best at-home fitness machine on the market. Please note! In the last month of 2018 the M7 model was upgraded is now superseded by the Bowflex Max Trainer M8, while stocks last it’s still a very compelling machine. Also the M7 is still available in Canada. Now, don’t miss this special opportunity: Bowflex is running a exclusive offer on their remaining Max Trainer M7s. The Bowflex Secret Sale. Use code SECRETSALE to get the Max Trainer M7 for just $1,299 (here>>) – in other words $900 off with free shipping (you save a whopping $1,050 with this coupon). Get ’em while stock last. Strap in for a comprehensive review of the Bowflex M7. We’ll cover everything that’s inside, the pros/cons, who will benefit most from buying and using the M7, and more. If the Max Trainer M7 from Bowflex is in your sights, make sure you read this entire review in full before making your purchase. The Bowflex M7 utilizes the same Max Trainer technology as the Max M3 and the Max M5 do. The technology is a combination of movements. On one hand, you get fluid motion like if you were using the elliptical machine. On the other hand, you get the leg workout like if you were on a machine like a stair climber. Combined, these two forms of motion have a very powerful effect. They help you lose weight more quickly. The M7 boasts that the user is able to lose close to 300 calories in a span of 15 minutes or less. That number seems outrageous because it is – nothing really comes close to exercising on a Max Trainer, the M7 especially. Of course, the number of calories you burn will depend on your intensity, but in general, you will burn calories at a very fast rate with the M7. If that sounds good to you, continue on to learn more about the specifics of the machine – it packs a powerful punch. 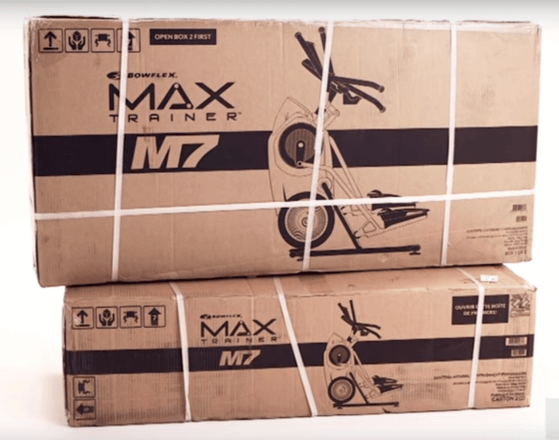 The Bowflex Max Trainer M7 comes in two rather large boxes. Use coupon code SECRETSALE to save $1,050 on your purchase of a Blowflex Max Trainer M7, includes free shipping, just enter coupon code “SECRETSALE” at checkout. Only if you live in the continental U.S. The Bowflex Max Trainer M7 is the only model in the Max Trainer series to have a fully-functional display. The screen is quite large and backlit for easy reading. On the screen, you see metrics like how long you have been exercising, how many calories you’ve burned, and much more. Another unique feature of the Bowflex M7 is how it adapts to the user’s fitness level. The M3 and the M5 rely on you knowing when you are getting more fit (lower resting HR and higher VO2). You have to gradually increase resistance levels and the length of your workouts as you do. For the beginner, this can be strenuous, and you might increase too much, or too little. The M7 will automatically adapt based on your goals and if you are meeting them. If you do meet your goals, you are presented with a new workout plan that has you moving forward and getting as fit as possible, as quickly as possible. If you lag behind, the programming doesn’t leave you behind – again, it adapts to get you over the hurdle and onto the next level of fitness. The Bowflex Max M7 has preset workouts in the double digits for you to choose from. You pick a workout based on what your fitness objective is. For example, if you want the most weight loss, you would pick a cardiovascular setting and use the M7 for a longer period of time with less exertion. If you wanted muscle gain, you would choose a setting for that and work for a shorter period of time with more exertion. When you pick your program, the M7 will coach you through it with on-screen instructions. This is a step-up from the M5, which offers the preset workouts, but no helpful coach. Getting a Bowflex for you and your spouse? Or even for the entire family? With the M7, everyone can work out at his or her own pace without disrupting others who also want to use the machine. Each user profile lets you save individual goals and workouts, so four people can take advantage of everything the M7 has to offer. The M7 comes with the Max Trainer app, too. The app syncs, tracks, and shares your workouts. Basically, it keeps you organized. This is a big plus for anyone with a hectic schedule who “squeezes in” workouts – you won’t have to put in extra effort to keep yourself on track. Everything is automatic with the app. The Max Series in general is made with extremely high-quality materials. They’re lightweight, durable, and they even feel nice to the touch. 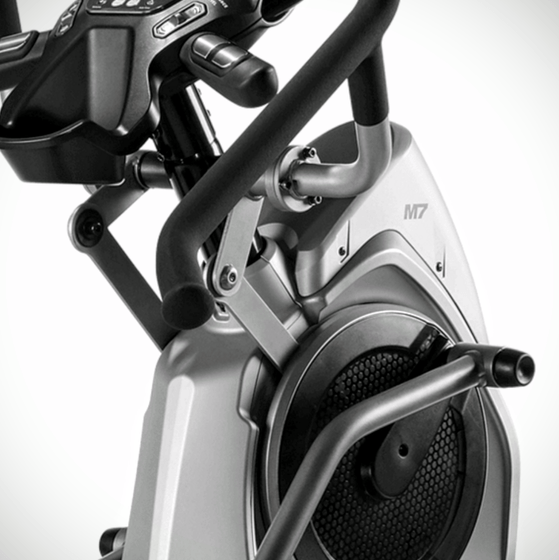 The M7 takes it a step further with next-level materials like stainless-steel racing pedals and ergonomic hand grips. The small improvements throughout the M7 make a big difference. Using the M7 feels… different, but in the best way possible. Free shipping is always a big bonus when it comes to exercise equipment. You’re probably used to seeing shipping cost somewhere between $5 and $10. For exercise equipment, though, because of its size and weight, that price can be closer to $100, or even up to $200! Free shipping removes this cost from your purchase price. Last but not least, the Max Trainer M7 comes with a 2-year warranty. The warranty covers every basic part – the only way it wouldn’t cover your machine is if you tried to do at-home modifications, which we doubt you will be doing. Use it as it’s supposed to be used and you’re covered. Two years is pretty good in the grand scheme of things – most exercise equipment cuts off at six months or one year. Even the M3 has just a 1-year warranty, though the M5 does have a 2-year warranty as well. Did you experience information overload when looking at those features above? No worries – we’ll recap. All-in-one. Hop on the Bowflex M7 and all of your workout goals will be met at once. The functional design works your entire body with one motion, and that is no exaggeration. When you get off, you’ll feel the burn everywhere. You don’t have to perform different exercises to get a full-body workout – who has time for that, anyways? All the tech. Preset workouts. A built-in coach. A huge display screen. Automatic adaptation to your progress and goals. Even a smartphone app! No other all-in-one fitness machine at this price comes close to matching the M7 in tech capability. And the easy-to-understand user manual will have you up and running within hours (check out some youtube Bowflex Max Trainer M7 Reviews). Anyone can use it. The M7 is made so that you don’t need any knowledge of exercise to have great success with it. Pick a preset program and you’re off – the machine will do all of the calculation for you. Up to four people can use the M7 with their own settings, too. Fast and attractive results. The main reason you’re buying a Bowflex is to look good, right? The Max Trainer series will make you look good. You’ll remove fat from every part of your body, and you’ll gain the muscle you need to look full and healthy. The before and after pics from customers using the M7 are extraordinary! Expensive. The M7 comes in at just under $2,200. It’s not necessarily cheap. But, it’s not necessarily terribly expensive, either… for everything you get, that price is pretty good. And it’s only about $600 more than the M5, which doesn’t include many of the features that the M7 does. Overkill for the very casual exerciser. We mean “casual” in the sense that you exercise just once every few weeks or so. If you’re not consistent, there’s no reason to get the M7, you should review other options. But if you are consistent – or you’d like to be consistent, finally – then the M7 is a good fit. Review conclusion: Who should buy the M7? Basically, the Bowflex Max Trainer M7 is for anyone who wants to invest in an exercise machine that will have a big payoff down the line. In terms of functionality, the M7 is second to none. We covered all of the customization and tech options, so we won’t bore you again. Just understand that this is one of the most robust exercise machines that a homeowner can buy for a reasonable price. In terms of results, the Bowflex M7 is the leader – again. The technology within the machine means you burn calories at a faster rate. That means you lose weight faster, and you gradually gain muscle tone as you do. What’s not to love? If you are on a budget and slightly under $2,200 ($2,199 to be precise) is out of your price range, consider checking out the cheaper models, the M5 and the M3. But if you want the best – and you’re willing to invest in your health – then we would strongly recommend making the jump to the top-of-the-line model. Even if you somehow don’t like it, you can always return it within six weeks – no questions asked, no hassles. Our current recommendation is to purchase the M7 with free shipping from the official Bowflex site. Keep in mind! 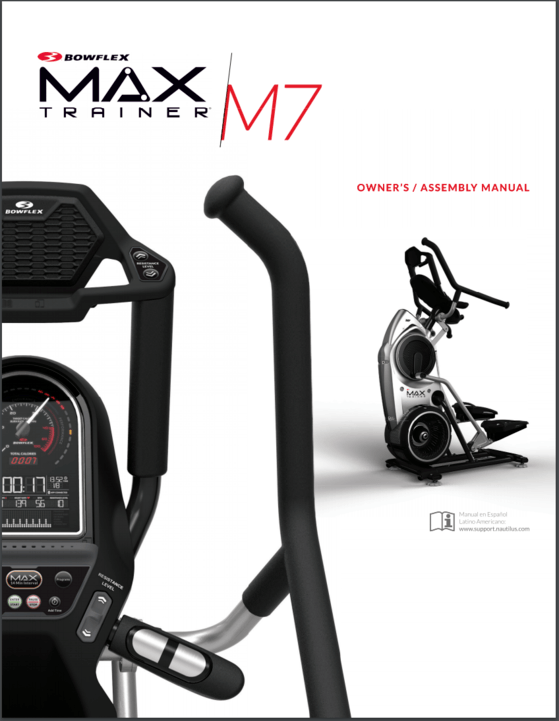 In the last month of 2018 the M7 model was upgraded is now superseded by the Bowflex Max Trainer M8. However the M7 is still available in Canada.